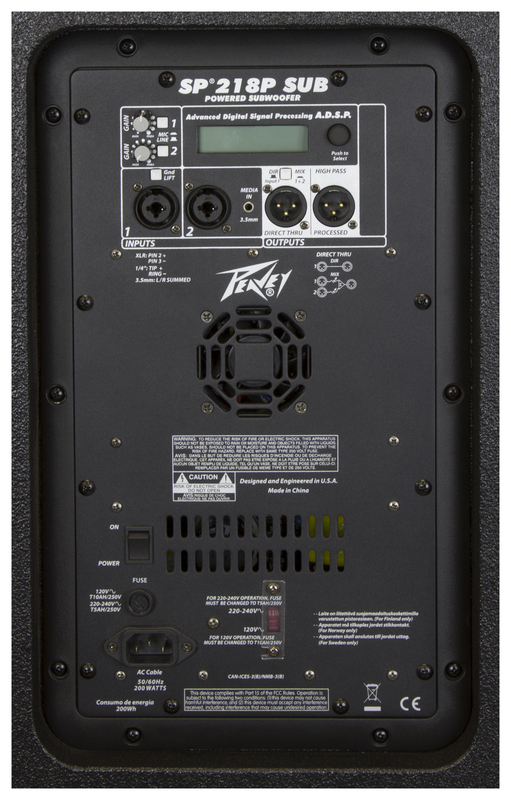 The Peavey® SP® 218P Sub is a vented powered subwoofer system utilizing two Peavey® exclusive Pro Rider™ 18" woofers, coupled to a power amplifier with 2,000 watts peak available power. The full-length black perforated steel grille provides protection and a professional appearance, along with the steel handles and tilt-back casters for transport. Internal line-level crossover with two outputs, independently electrically buffered; one full-range thru output, and one high-pass output. A threaded pole-mount system provides a sturdy and stable platform to mount a suitably equipped speaker system above the sub woofer. Either the SP®2P or the SP®4P two-way powered speakers are an excellent partner for the SP® 218P Sub. 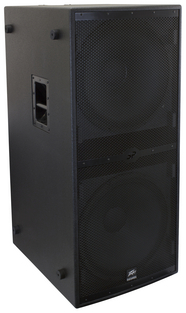 The SP® 218P Sub speaker system power amplifier providing the power is a low-distortion ultra-reliable fan-cooled unit providing 2,000W peak available power for the system. 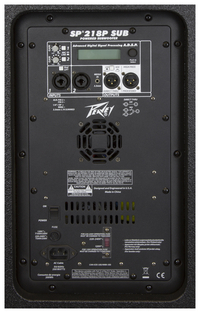 The power supply for the power amp is a switch mode type for low weight and high efficiency. The amplifier features our DDT™ compression, which virtually eliminates audible power amplifier clipping. Cooling is provided via a low-noise fan, for reliable operation under any conditions. Input is via two channels of a combo female XLR and 1/4" TRS phone jack with balanced input to the preamp/EQ electronics, and a level control. 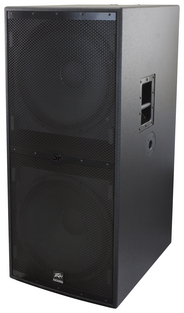 The internal speaker crossover and processor is implemented with a high-performance DSP system. Using 24 bit ADC's and DAC's operating at 96 kHz, the 32 bit fixed point DSP processor provides all the filtering and EQ functions to allow the subwoofer to operate at it's best. DSP based limiting works in conjunction with the DDT™ compression to improve woofer reliability without intruding into the musical performance. An LCD display shows what functions or presets have been selected, these functions are selected via a push-to-select rotary knob. A High-Pass output provides a buffered and balanced output signal for a satellite speaker to carry the high range of the music, via a male XLR jack. A Full-Range Thru output has a male XLR connector. This output allows linking of additional speaker systems, or feed of the signal to other devices, etc. TILT-BACK CASTERS FOR EASE OF TRANSPORT.